The land where the Sidney & Berne Davis Art Center is built has a long history and, therefore, has become part of the local heritage. The site was originally a Native American Calusa settlement hundreds of years ago. In the mid-1800s, it became home to the original fort of Fort Myers, which also housed soldiers. Then, in 1933 a 23,000 square foot United States Post Office was built to replace the fort. Upon opening, the building attracted visitors from near and far who came to marvel at its unique architecture and ornate decorative details. A rare masterpiece of Neoclassic Revival architecture in Florida, the building’s massive columns were made of limestone from the Florida Keys. Plus, the walls were embedded with coral formations and sea shells. The Post Office, designed by prominent Florida architect Nat Gaillard Walker, opened on the site. The winter homes of leading figures like Thomas Edison and Henry Ford were mere minutes away from the post office. The open-air loggia with its massive ionic columns allowed local visitors and residents such as Mina Edison, Charles Edison, and Henry Ford to retrieve and send their mail. In the 1960s, the building was converted into a federal courthouse. It housed government offices that serviced Southwest Florida for over 30 years. After a new courthouse was built nearby in 1998, the building was vacated. The vacant building suffered deterioration from water damage, which only added to the great wear from years of public use and deferred maintenance. 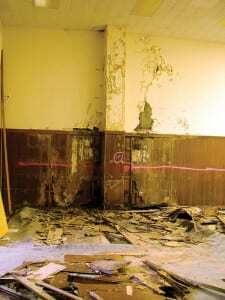 The building fell into disrepair and much of the original fixtures were removed or destroyed. In 2003, Jim Griffith and Florida Arts, Inc. (a 501c3 not-for-profit organization) acquired a 99-year lease from the City of Fort Myers on the building. Florida Arts, Inc. agreed to meld the past with the future by restoring the building to its original magnificence, while creating a modern arts facility. A Division of Historical Resources grant in the amount of $350,000 was awarded in 2004 to stabilize the building and stop water infiltration. This grant provided a new roof and complete restoration of the decorative steel cased windows throughout the building. Matching funds came from individual and corporate donors and the City of Fort Myers. In 2006, Berne Davis pledged $1 million to Florida Arts, Inc. for the building’s restoration. In honor of the Davis family contribution, the building was renamed the Sidney & Berne Davis Art Center. In 2007, construction for Phase 1 renovations began, which included mechanical and structural work. All chiller, plumbing, electric, and HVAC lines were installed or plumbed out on the mezzanine level, and a new concrete mezzanine floor was poured for ADA compliance. Phase 1 was completed June 2008, with the exception of the original door openings in the front loggia area, the first floor air conditioning, and the granite flooring. Completion of these three remaining items was at budget and ahead of schedule, so the building opened to the public September 10, 2008. By 2008, 10,000 square feet of the building had been restored. Then, Phases 2 and 3 renovations started. In Phase 2, the elevator was installed. In the next phase, the building’s second floor was renovated to include the Capital Gallery, a state-of-the-art recording studio, and classrooms for the arts program. In addition, the gorgeous artist green room was completed on the mezzanine level. Finally, the restoration of the historic ceiling in the main lobby rounded out the Phase 3 renovations. The majority of these changes were made possible by a grant from the State of Florida Division of Cultural Affairs. By the end of 2014, the Sidney & Berne Davis Art Center had revitalized a once dilapidated classic Florida structure, and the downtown River District along with it. (Gallery photo showcasing the work of London Amara). The final phase of restoration will transform the rooftop into a sculpture garden and reception area. This last amendment to the building will help the Sidney & Berne Davis Art Center continuously provide world-class arts programing and events to the community.